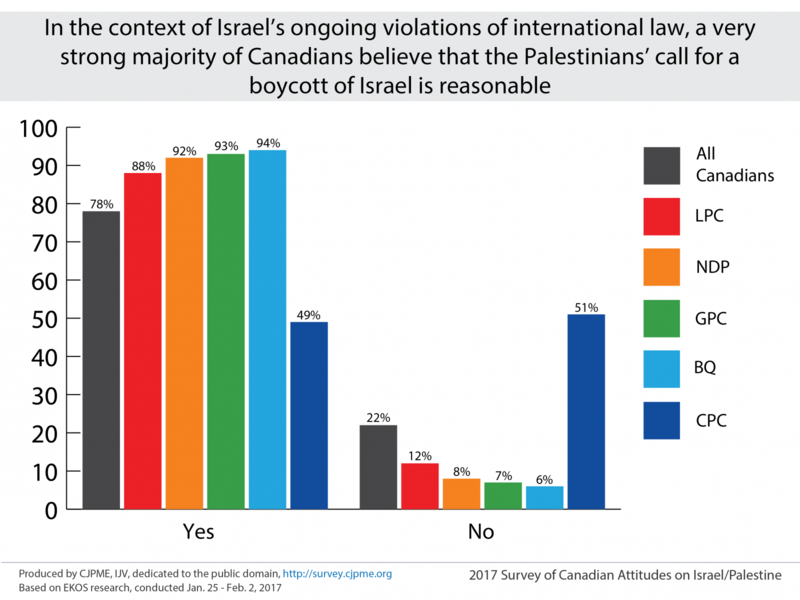 Groundbreaking new poll results show broad support in Canada for boycotts and sanctions against Israel. The Palestinian call for a boycott of Israel was considered a reasonable response to violations of international law, including Israel’s ongoing construction of settlements on occupied Palestinian territories, by 78 per cent of respondents, while 66 per cent said sanctions were reasonable. “These results should give courage to those MPs who want to do the right thing on this issue,” Thomas Woodley, president of Canadians for Justice and Peace in the Middle East, told Ricochet by telephone on Thursday. The poll was carried out by EKOS and commissioned by CJPME, Independent Jewish Voices, and several individuals. The first part of the polling results, released last month, revealed that a majority of Canadians believe their government is biased towards Israel in its Mideast policy. The new results should give pause to the governing Liberals, who, with exception of a few MPs, voted in February 2016 in support of Conservative MP Tony Clement’s motion to condemn civil society movements that advocate for boycott, divestment and sanctions against Israel. Official Canadian government policy calls for a two-state solution in the Middle East and is opposed to Israel’s policy of settlement-building in the occupied Palestinian territories. As prime ministers, both Stephen Harper and Justin Trudeau, however, have been outspoken in their condemnation of BDS strategies used by groups in Canada advocating for peace and justice in the region. In 2015, as opposition party leader, Trudeau condemned BDS activism at his alma mater of McGill University. Despite Trudeau’s prominent opposition, in February 2016 a motion was passed at McGill calling on the student union to adopt BDS. Will political parties follow public opinion? In December 2016, the Green Party of Canada adopted a policy calling for sanctions against Israel following a bitter, months-long internal debate.